we were lucky to have inherited a small and very old pear tree. small tree off once and for all. but it still continues to grow despite that. 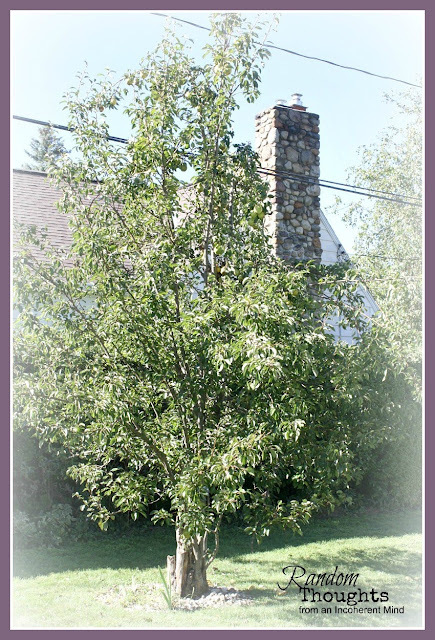 Here is our tree, just a few weeks ago, after we harvested the pears. This recipe comes from The Pioneer Woman. Preheat oven to 350°. Peel, core and dice pears. Place in a bowl and stir together with 2/3 cups sugar and ¼ teaspoon salt. Set aside. In a separate bowl, combine flour, sugar, brown sugar, cinnamon and pecans. Stir together. Drizzle melted butter gradually, stirring with a fork as you go along until all is combined. 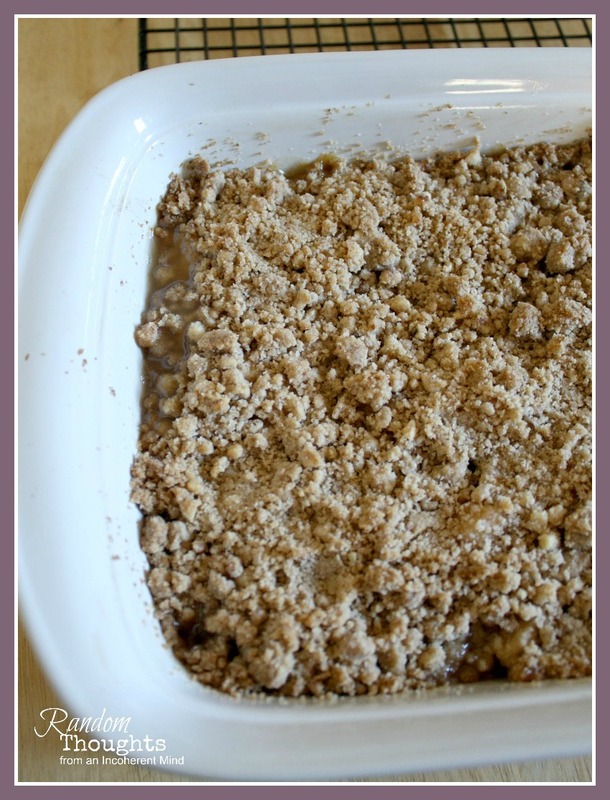 Pour pears into a buttered baking dish, top with crumb topping. Bake at 350° for 30 minutes. Place pan on top rack of oven for an additional 10 minutes or until topping is golden brown. Oh it is soooo good! What are you planning to bake for Fall? I love apple crisp so def. gonna have to try this one, thanks G!! I am in a baking mood! I'm going to add this to my list! Thanks and Happy Fall, Gina! Yum! What a wonderful recipe! Sounds delicious! How lucky you are! I love pears used in recipes. They always seem like the forgotten fruit to me. Yum! So lovely you can go out to your yard and pick the fresh fruit right off the vine. We also had a very old one when we moved to this house 15 years ago but I was so misguided back then and we got her down... I wish I didn't... now, I don't even want to listen and go on planting. The other day I remembered wanting a nut tree when I moved in and people saying "silly. (but thinking I was the nut one ahahahah) it will take 20 years to see it grown" while I was in the garden when I realised 15 years were already gone, and I'd have an almost grown up tree had I followed my want... needless to say I went out and bought one that exact day. I'll see it grow and if I don't, well someone will and enjoy the fruits. PS - And thank you for the icecream tip as it is still too warm here so this is a perfect I-want-Autumn-but-enjoying-Summer recipe. Looks yummy! I haven't baked anything fallish yet, it's still hot here. I'm so ready for colder weather! Looks and sounds wonderful! I love pears and will definitely try this. Thanks for sharing! Its been a rainy day here in Alberta, and definately feels like fall! I just took a pumpkin chocolate chip loaf out of the oven. May have to make a cuppa something and get a blog post done! Happy fall baking to you my friend. The pear crisp sounds delish!! I'm in an apple mode right now but pears are a great idea. How wonderful to have your very own tree! That picture of the tree is perfection. I haven't planned on baking anything yet, but I think I'll try this! How neat that you have your own pear tree. Thanks for posting the recipe! Goimg to buy the ingredients... if you see this before I arrive there tell me "are the pecans an absolute must? or can I give it a skip and still tastes and looks great?" Gina - I do not know how I missed this post earlier, but I am so impressed with your pears! We lived in an old home with a beautiful pear tree once and never got a single ripe pear from it in the 10 years that we lived in that house! The squirrels always got to them first! Your recipe sounds so good and looks yummy! Yummo! 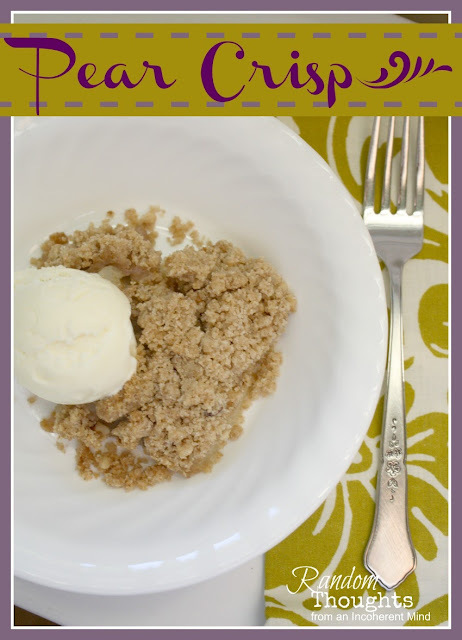 I love apple crisp but have never heard of pear crisp before...and I love, love, love pears. Can't wait to give it a try. This looks delicious! I've made lots from her cookbook ~ everything is so good.